Stems: Ascending to erect, branched, glabrous or stipitate-glandular distally. Leaves: Basal and cauline. Basal leaves petiolate; blade spatulate to linear-oblanceolate, .8 to 6 inches long, .08 to .9 inch wide, margins entire or remotely dentate or few-lobed, surfaces glabrous or sparsely glandular-pubescent. Cauline leaves petiolate or sessile, 1-4, gradually reduced, oblanceolate to linear. Inflorescences: Heads 1. Peduncles terminal or axillary. Calyculate bractlets 0. Involucres turbinate to campanulate, .08 to .2 inch. Phyllaries 5-10, erect in fruit, ovate or lanceolate, apex acute. 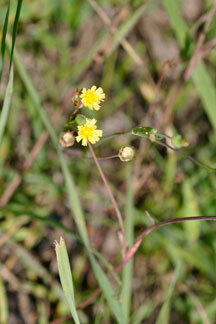 Flowers: Florets 12-35; corolla yellow, .08 to .28 inch long. Fruits: Achenes brown, obovoid, .05 to .06 inch, glabrous; pappus absent. Seed 1. Comments: Our plants belong to the widespread var. cespitosa. Krigia for David Krieg, a German physician who collected plants in Delaware and Maryland and cespitosa, stemless.